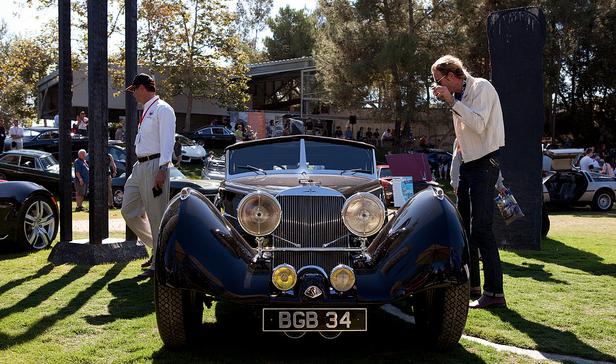 Top transportation designers, car collectors and auto enthusiasts merge minds Sunday, Oct. 21 at the annual Art Center Car Classic. Held at the Hillside campus, this year’s theme “Inspired Design” will showcase a highly curated field of rare automobiles, surprising classics and innovative vehicles from the 1930s to present that served as inspirations for Art Center alums around the world. Special guests include Ron Hill, Art Center alum and former Chair of the Transportation Design Department, who counts Corvettes, Camaros and Cadillacs among his designs. Auto aficionados Dave Kunz, KABC automotive reporter; Barry Meguiar, host of Speed Channel’s Motor Trend; and Ed Justice Jr., co-host of Motor Trend radio, will serve as emcees. Impromptu interviews with transportation designers and car collectors called “Stories Behind the Design” will be broadcast during the event. Patrons can also tour Art Center’s design studios, rapid prototyping facilities and galleries. The event is free for students, faculty, staff; $35 for their guests; and $35 for alumni. General admission is $55 online, $65 at the door. When: Sunday, Oct. 21, 11 a.m. to 4 p.m.
Pingback: L.A. artists turn Carmageddon into Artmageddon « Dotted Line | Official Blog of Art Center College of Design | Pasadena, CA | Learn to Create. Influence Change. Pingback: Driverless car gets green light in California « Dotted Line | Official Blog of Art Center College of Design | Pasadena, CA | Learn to Create. Influence Change. Pingback: Piaggio asks students to envision mobility in 2022 « Dotted Line | Official Blog of Art Center College of Design | Pasadena, CA | Learn to Create. Influence Change. Pingback: Spring appeal springs ahead: Total giving jumps 330% « Dotted Line | Official Blog of Art Center College of Design | Pasadena, CA | Learn to Create. Influence Change.